Gatlinburg Falls Resort recently welcomed new guest Pam, a prolific writer and blogger from nearby Georgia, who came to stay with her family in one of our mountain cabins. Pam, who saw an article in Southern Living Magazine listing Gatlinburg Falls Resort as “The #1 Best Family Resort in the Smokies” said she had visited Gatlinburg before, but never at such a luxurious location as Gatlinburg Falls. She enjoyed a wonderful stay at the cabin with her family and had these glowing remarks to make about the experience. 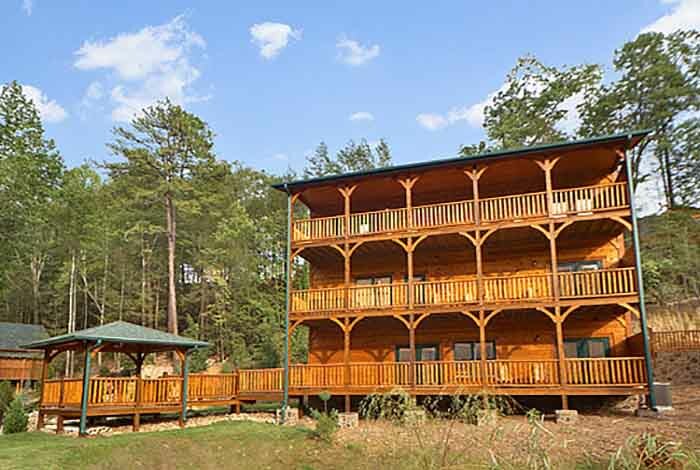 Pam and her family stayed in The Crown Jewel, a 5-bedroom cabin. This cabin, divided into three floors and sleeping up to 18, had plenty of space for Pam’s family of eight — six adults and two toddlers. Three bedrooms and baths were located on the upper floor. The main floor featured a large living room, the kitchen, and the master bedroom. And one bedroom, a theater, and a game room could be found on the lower level. One of the best features of the layout, Pam said, was that each bedroom had its own bathroom. Several members of Pam’s family also have special diets and specific food allergies, which meant cooking most of their meals in-cabin was imperative. Opportunely, they found the kitchen well-stocked with all the appropriate tools, dishes, cutlery, and prep supplies. They were also happy to find that even things like dish detergent, dish washing liquid, and garbage bags were supplied. For groceries, shopping was a breeze as the local supermarket is just one mile away. As Pam’s family included two toddlers, they were happy to find that all furniture in the cabin was sound, sturdy, and quality-made to handle the “testing” of exploring children. Moreover, there were no small nick-knacks or decorations that may have been dangerous for the children, and for the occasional accident, the in-cabin washer and dryer came in handy as well. In addition to having plenty of space for everyone in the family and safe furnishings for the children, Pam’s family especially enjoyed the game room. This large but cozy room features a pinball machine, pool table, golf game, air hockey table, and a video game with classics like Frogger and Ms. Pac-Man. Pam said it was the hit of the cabin! The Crown Jewel cabin features three floor levels, each with its own adjustable thermostat. As is the case with many families, temperature-wise, every member of Pam’s family has differing levels of comfort. Fortunately, with these separate thermostats, adjusting the temperature on each floor level was a breeze and made “comfortable coexistence” much easier. It’s always a treat to hear about other people’s experiences in the cabins. You can read Pam’s full account of her family adventure here: Gatlinburg Falls Resort, Gatlinburg, Tennessee.